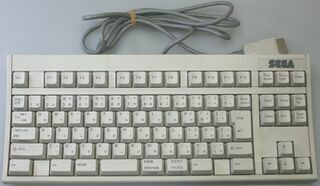 The Sega Saturn Keyboard is a keyboard peripheral for the Sega Saturn. Unlike its successor, the Dreamcast Keyboard, it did not see as much widespread release, mostly because few games were released in the west that supported it. It was released in Japan for games such as Habitat II (which was sometimes bundled with the unit) and was compatible with the Sega NetLink online service. It did not see a release in North America, however regular PC keyboards can be hooked up to the console via the NetLink Keyboard Adapter instead.